Floyd B. Parks (DD-884) was launched 31 March 1945 by Consolidated Steel Corp. Orange Tex. ; sponsored by Mrs. Floyd B. Parks widow of Major Parks; and commissioned 31 July 1945 Commander M. Slayton in command. Floyd B. Parks arrived at San Diego her home port 16 November 1945 and sailed 20 November for her first tour of duty in the Far East patrolling the coast of China and operating in the Marianas until her return to San Diego 11 February 1947. In the period prior to the outbreak of war in Korea Floyd B. Parks twice more deployed to the Far East for duty with the 7th Fleet returning from her second such cruise 13 June 1950 just before the North Koreans crossed the 38th parallel. At once she prepared to return to duty as a standby at Pearl Harbor available should war spread returning to San Diego 20 August. Floyd B. 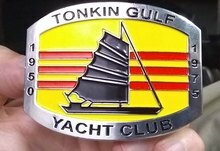 Parks sailed from San Diego 19 February 1961 to join in United Nations operations in Korea. On 16 March she joined the fast carrier task force screening them during air operations off the east coast as well as spending a total of 60 days in Wonsan Harbor on blockade and bombardment duty. She returned to San Diego 10 October 1951 and after west coast operations sailed for duty in the Far East again 31 May 1953 Along with duty similar to that of her first war cruise she patrolled in the South China Sea and the Taiwan Strait. She returned to San Diego 18 December 1952 and began a peace-time schedule of annual Far East cruises interspersed with west coast training operations and necessary maintenance. During her 1955 Far Eastern cruise Floyd B. Parks took part in evacuation of the Tachen Islands and while in the Orient once more 11 March 1956 collided with Columbus (CA-74) losing 2 men and a 40-foot section of her bow. Skillful work by her crew saved their ship and brought her safely into Subic Bay for temporary repairs. Upon her return to Long Beach Naval Shipyard 14 May 1966 Floyd B. 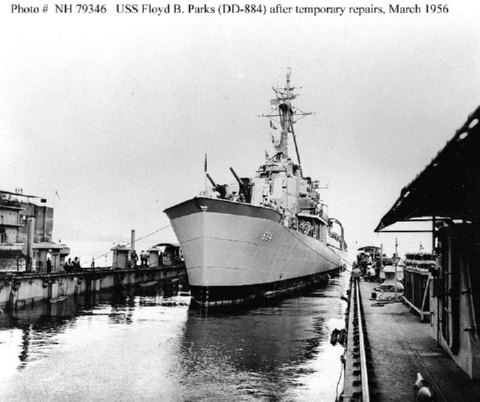 Parks damaged bow was replaced with that of the uncompleted destroyer Lansdale (DD-766) and after completion of repairs and installation of new equipment Floyd B. Parks returned to her west coast-Far East rotation through 1962.